When your vehicle is tested, the MOT looks at some important items to see if it meets the legal requirements. You should be aware that the MOT certificate is not a guarantee of the general mechanical condition of a vehicle. All UK cars over 3 years old require a valid MOT certificate by law. 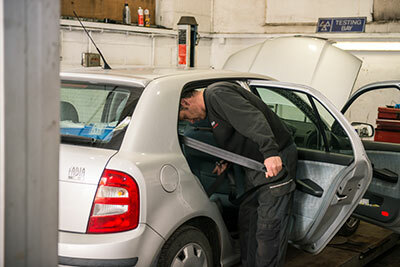 But unlike some less scrupulous garages we will only highlight work that is essential in order to pass your MOT. When work is required, everything will be explained to you in terms you can understand and naturally we will estimate all work that does need doing before asking you to authorise repairs. At your request any faulty or worn out parts can be retained for your examination. MOT tests can be carried out up to one month prior to the expiry date of an existing MOT certificate so long as you can provide that current certificate at the time. On passing the MOT test, we will provide you with a certificate valid from the date of expiry of your existing MOT certificate. If you live in or nearby to Bradford why not let us take care of you and your car when your next MOT is due.